Thanks to over fifty years of national space programs and now in the last decade entrepreneurial pathfinders, Space Commerce is gaining traction. There are similarities with previous industry cycles, like the dot-com boom, biotech and clean energy, but space as an industry has room for exponential growth. This is not only because space is massive, but the mandate to explore space, predicated by investing in space from national and private sources, is continuous (absent an economic force majeure). Investor appetite for space grows as risk is mitigated by new and successful ventures that may have been unfeasible decades or years earlier. 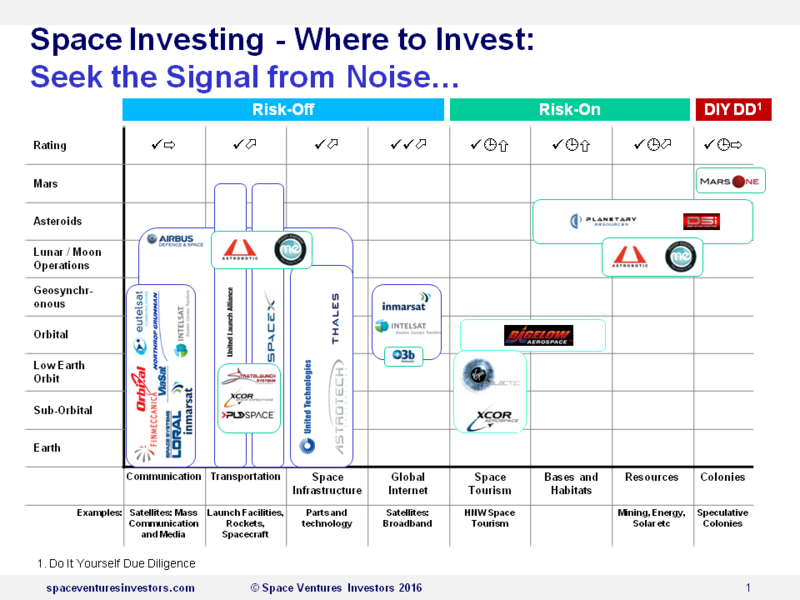 For advice on how to invest in space get in contact. ‣ Location: Investing in US, European and Global space companies. ‣ Financing by type: From Equity to Bond issuance, how various financial instruments fit disparate space companies. ‣ Space Verticals: From CubeSats and Internet of Things to long-term infrastructure projects, what has the momentum, where are the under-valued projects, and what are the pay-offs? ‣ Making the Leap: Practical Strategies to Transition into Space: What artificial intelligence combined with earth observation is gaining momentum, which major players are realistic in the race to launch new refuellable satellite swarms, and how to shift from mining on earth to mining in space? These are some of the questions that have practical answers backed up by straight-forward business plans. As the space industry grows, there are existing, and new companies, developing business models and technology that require working capital to bring their idea to the space commerce market. Emerging space companies are founded and staffed by intelligent and passionate scientists and entrepreneurs, but like all good businesses and ventures, capital is required. If you are a High Net Worth Individual, Family Trust or Corporation looking to invest directly in a space company we can help you in finding the right match for your investing expectations, including space business model due diligence, and a tailored investment strategy. Syndicated and pooled investing from High Net Worth Individuals, Family Trusts, Corporations and Private Equity are ideal to fund space companies that require significant capital to get their technology from the drawing board and into orbit. We can help in matching investors with space companies, including space business model due diligence, and tailored investment strategies. Our business is to invest in space for a profit. Our shareholders are voters and our scalability and strategy is based on consultation and consensus with our investors. 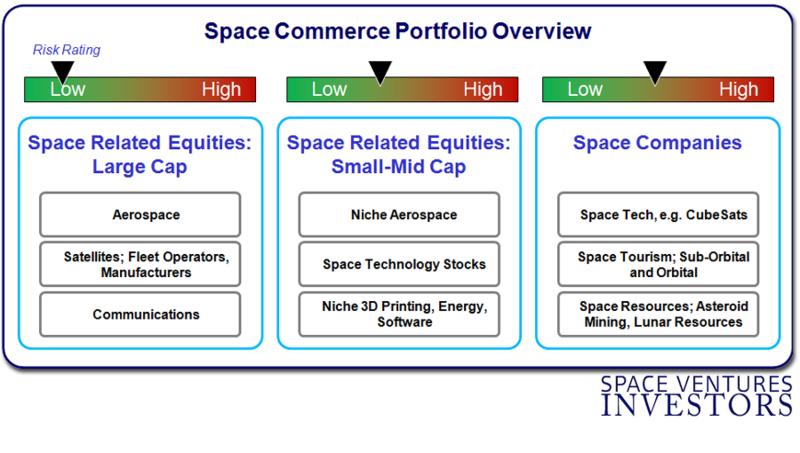 As an investment theme space is slowly and inevitably becoming more attractive and profitable, and the time to hedge in space is now. As lower launch costs, lower hardened for space technology and propulsion costs filter down, plus the ongoing miniaturisation of sophisticated technology, the holy grail of space commerce will be when space goes 'consumer'. That in itself is as an opportunity surprisingly close and has similar traits to the drive in the dot-com and digital era to find the ultimate game changer. Publically listed aerospace companies that have space business units. Aerospace is well established yet space spin-offs and dedicated space units offer value through intellectual property, space related infrastructure contracts, and new uses of existing hardware and software. Publically listed satellite makers, operators and managers �including downstream satellite data spin-offs. Currently satellites are space commerce and the evolution of satellites will play an important role in space commerce. For more information read our satellites page. Publically listed Space Infrastructure Companies � A focus on pure space-play and space-involved companies, that offer vital services such as communication, propulsion, and globally positioned ground stations. These companies have the funds, the technology and the expertise to leverage game-changing space commerce business models. Private Space Companies - From the space start-ups comprised of motivated engineers to funded large private companies making important in-roads and meeting milestones. Our criteria for Space Commerce.